"During the summer before my junior year in high school, my mom took my brother and me for some tours at a variety of schools in the area, and Miami was one of them. I was struck by the picturesque beauty of the campus, which is very much what you imagine when you think of college. But that was only one part of the equation for me. "I have always wanted to write in my professional career, so during that trip I went to several meetings with the journalism faculty in the Media, Journalism & Film department, including the chair, Dr. Richard Campbell. I also met with Dr. James Tobin, who is the advisor for University Academic Writing Scholars as well as for The Miami Student. "As cliché as it sounds, I was struck right away by how welcoming Drs. Campbell and Tobin were. They took me and my mom into their offices, told us about the program, asked about my interests, and so on. They really engaged my interest in a two-way conversation, which was something that I didn't get a sense of at some of the other schools that I visited. This mutual respect of interests really impressed me, and they both stayed in touch with me after that initial visit to check how my senior year in high school was going and if I had any more questions. That collegiality and openness was really striking. "I have a very, very rare neurological condition that has rendered me unable to feel pain, temperature, or touch, so my treatment has been very complex throughout my life. Therefore, another important reason for me in choosing Miami was that I needed to stay close to home, which is in Cincinnati, so I could continue to receive care. "My mom and I spoke to Andrew Zeisler, who is the director of student disability services, for an hour and a half. My mom had this list of questions about the health challenges involved with me attending college, and he patiently went right down the list with us, telling us it was no problem. For example, when I take off my cochlear implants at night, I'm completely deaf, so would I be safe in a dorm room if an alarm were to go off in the middle of the night? And Andy assured us that it would all be handled. Megan Zahneis gives a speech about disability. "You see, I wanted my college choice to be independent of my disability. I didn't want to make decisions based on limitations or logistics like that, and I felt that Miami was the least restrictive environment. We walked out of that appointment with Andy feeling for the first time like college was a real possibility for me. My mom was near tears with emotion—wow, despite the challenges, this is really something that can be accomplished! "All of this told me that Miami saw me as an asset, someone able to bring something to the table. Knowing I would be surrounded by these incredibly bright-minded students and faculty, maybe with the ability to contribute a little bit—that was our end goal, and I knew, along with my parents, that Miami was the place where I really belonged. "My first year here was definitely a challenge, but it was an enlightening and gratifying challenge. I had my disability, but Miami allowed me to put academics at the forefront. It has been a good place for me, intellectually, academically, socially, emotionally, and logistically." "When I started at Miami, I was one of 19 first-year students accepted into the University Academic Scholars Program in Writing for the Media, which is facilitated by Dr. Tobin. He taught an introductory course on journalism that was specifically tailored to our group, and it was one of the things that helped me feel engaged with Miami and the community right off the bat. We all got along like a family, all interested in the same field of study, and Dr. Tobin was the one that made that happen! 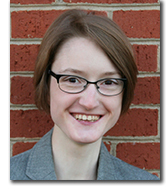 "As my advisor and mentor, Dr. Tobin is the one that I can call at any time with questions. It's this connection that has shown me that he genuinely cares, and all my other professors have been the exact same way. Although I had to contend with more issues than other students due to my special needs, Dr. Tobin and my other professors were extremely helpful in taking a bit of the load off me in the classroom so that I could focus on being my best self academically, emotionally, and socially. "I'm one of the news editors for The Miami Student, which I became involved in after visiting a practicum about the newspaper. From the start I found a community of collegiality and camaraderie in the newsroom. It felt great to know we were all working towards a common goal of producing a paper twice a week, which at times could be daunting and exhausting but also incredibly gratifying. Starting as a staff writer, I started to pitch my own story ideas and worked on more independent projects, making the newspaper really one of the cornerstones of my freshman year. 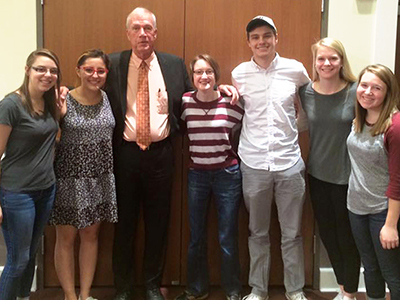 Legendary Boston Globe editor Walter V. Robinson poses with Megan Zahneis and her fellow journalism students. "Two other integral experiences during my first year at Miami were my involvement with the Wilks Leadership Institute (part of Miami's Division of Student Affairs) and my work with the Stamps Scholars Program. My engagement with the Wilks Leadership Institute started when I joined U-Lead, a retreat with 24 other incoming freshmen. I also participated in Wilks' Leadership Certification Program, where I attended lectures and seminars related to leadership during both semesters. Having been involved with leadership in high school, this was something that I really wanted to continue to learn about. "The Stamps Scholars Program is part of the nationwide Stamps Family Charitable Foundation, and all the scholars focus on spreading its philanthropic message. Getting to meet other high-achieving students and finding things in common with them was really neat. I now serve as one of the executive members of the board for our student organization." 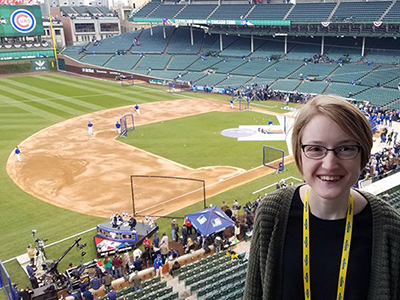 "I'm pursuing majors in journalism and interactive media studies, with minors in disability studies and community-based leadership, but I'm interested in learning about so many other fields of study, from psychology to comparative religion to history and philosophy and so many others! I've just been very overwhelmed, in a good way, by all the amazing courses I can take, both within and outside the Miami Plan. "Looking at my degree audit report (DAR), I find that there are 30, 40, 50 different classes that can cover the same requirements of the Miami Plan. I find this to be a big advantage of the liberal arts, because it's a chance to explore various subjects more deeply. Journalism requires a secondary major, but my professors told me early on not to feel obligated to lock that in right away. They want us to explore, taking classes that are intellectually stimulating, and then use them as a touchpoint for declaring a second major or minor. That wouldn't have been an option at schools that don't have a robust liberal arts program. Miami has experts on almost everything in the world, so if there's something I want to know about, I can find out about it. As someone who is naturally curious and needs to understand the world around her, where better to be? "My love for journalism evolved from a love for writing and reading. The way I see it, growing up I spent a lot of time in hospitals and doctors' offices, when a lot of kids my own age were having play dates. I had to pass the time somehow, and for me that became reading, and then from there I would start writing because it became a cathartic, therapeutic way for me to get out some of my frustrations. I'm not sure yet where I want to go career-wise, but I do know that I want to tell stories. I believe everyone has a story, so I want to make it my duty to uncover stories from every corner of the Earth. And the way it all started was trying to tell mine! 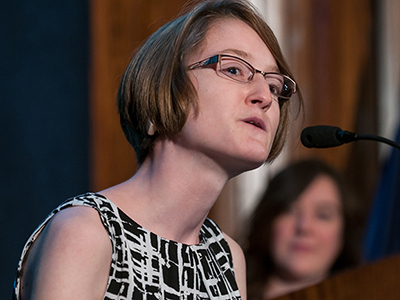 "This is why liberal arts, especially journalism, is so important to me. It helps me share my story in a positive way. All I want is to make a difference and help inspire others, so to be able to relate to people is really important. I love trying to capture the essence of a person or topic in order to educate and inform, and it's really humbling and gratifying when I feel I've accomplished that." "My high school prepared me in a lot of ways to become a Miami student, but unfortunately it didn't have a journalism program. I got involved with my high school's student newspaper (before it was cut due to funding issues prior to the start of my sophomore year), became a columnist for MLB.com, and did what I could to understand journalism without being able to formally study it. "At Miami, however, I've been able to learn a lot from Dr. Tobin, a former journalist, and other faculty. They all have really individualized, unique specialties, and I've taken classes on narrative storytelling, memoir, newswriting and reporting—and there's been no better experience, for me at least, than getting involved with The Miami Student, which was named the best non-daily newspaper in Ohio for the past year! "Being able to dive right into my courses, getting involved in a newsroom, and writing creatively in my classes has told me there is so much more to learn and absorb, so many more opportunities out there for me. All I have to do is express interest and go for them. "Professor Patricia Newberry maintains a listserv for the Department of Media, Journalism & Film announcing all sorts of internship and writing opportunities, including new classes and extracurricular writing projects. My mom got mad at me last year because I kept forwarding all the emails to her, saying, 'Gosh, Mom, look at all this!' Every single thing is interesting and fascinating to me. "My most recent leadership experience is being a founding member and co-president of the Students with Disabilities Advisory Council, which was formed last year. We consider ourselves the voice for students with disabilities on Miami's campus. We brought together a group of like-minded students and put together an official student organization. We've started a mentorship program for incoming first-year students who identify as having a disability, and we keep looking to see where can we best fill that need. Our flagship program is an event called Coffee and Conversations, where we invite faculty to listen to a panel of students with disabilities, myself included. It's a time to promote awareness and get people thinking about disabilities in the classroom. Our organization plans to continue focusing on working with the campus and Oxford communities, increasing awareness and highlighting the stigma surrounding disability." "The best thing I was always told by my parents and teachers was that I didn't really have limitations; within reason, I had the ability to do whatever I wanted. Having an abstract goal like this is hard to quantify—how do I parlay my skills into a career, what do I major in, what classes do I take in order to make a difference? That journey became learning more about myself—how I could make change, recognize my own talents and weaknesses, discover what really engaged me and what didn't. "And so, as cheesy as it sounds, for those who want to form some sort of change, it really has to start within. Reach out to others who have made that same commitment and have been successful in doing so. At Miami, you don't have to look far to find those people. It's just a matter of empowering yourself. "College is a really unique opportunity to brand yourself, rediscover yourself, and figure out what you're interested in and what you want to do for the rest of your life. Take that chance while you're here! "This could mean stepping outside your comfort zone, especially when interacting with someone whose perspective might be different than yours. The vast majority of Miami students are very welcoming and understanding, and a lot of change can really happen with the right people, motivations, and incentives. It's your imperative to act upon anything that you feel strongly about and wrestle with it in ways that are intellectually complex, challenging, and stimulating. "In the end, it's all about stretching and changing your world views and adopting new and different perspectives on things. This all goes back to the liberal arts, where you can cast a really wide net to do things that scare and excite you. You'll be stimulated as a person, as an academic, in ways that you would never have otherwise approached."